I figured I would be able to make it into Central London after work within an hour, but I totally underestimated how long it would take to walk from the station to the Serpentine lake. Getting there was a mad rush, I arrived with minutes to spare before the race actually started. I was stressed and flustered setting up my transition area, managing to spill baby oil everywhere and rip my race number which then wouldn’t attach to my race belt. Thankfully the race organisers were understanding about my lateness- I was supposed to be in the first swim wave, but I asked to be moved to the second group to allow a few minutes to prepare myself. I totally missed the race briefing, but my friend Nikki from my triathlon club was already there to fill me in on the details. Glen came along to spectate but an over-zealous lifeguard banned him from entering the area alongside the lido. He had to watch from a bush, and tried to catch a few photos of me from a distance! The event was organised by a charity who aim to promote fitness in the older community, although the Aquathlon was open to all ages. The race was fairly small with only 45 people taking part, so the swim start was not too crowded. 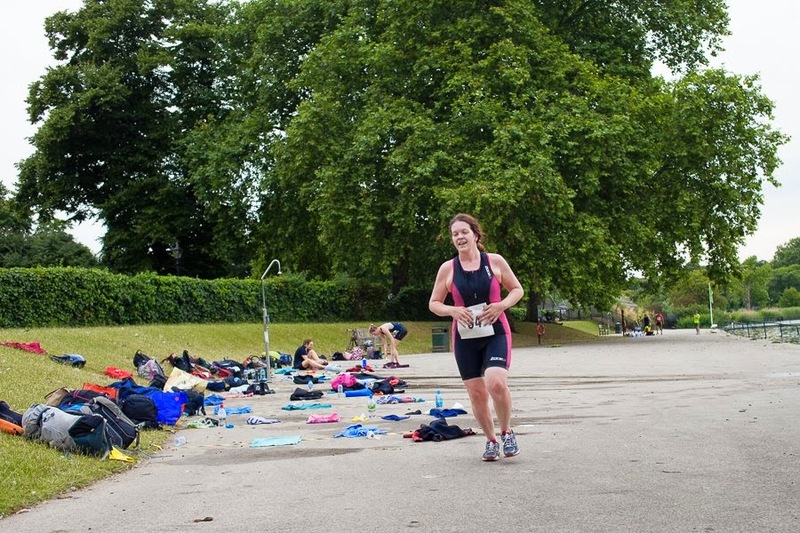 The 500m swim was 5 lengths of the lido, which was in an area cordoned off from the main Serpentine lake. Every time I swim in open water, I can’t actually believe I am doing it! Open water swimming is not something I would have considered 18 months ago. My phobia of birds would have stopped me venturing into a lake or lido, these days I just try not to overthink it and just dive in! 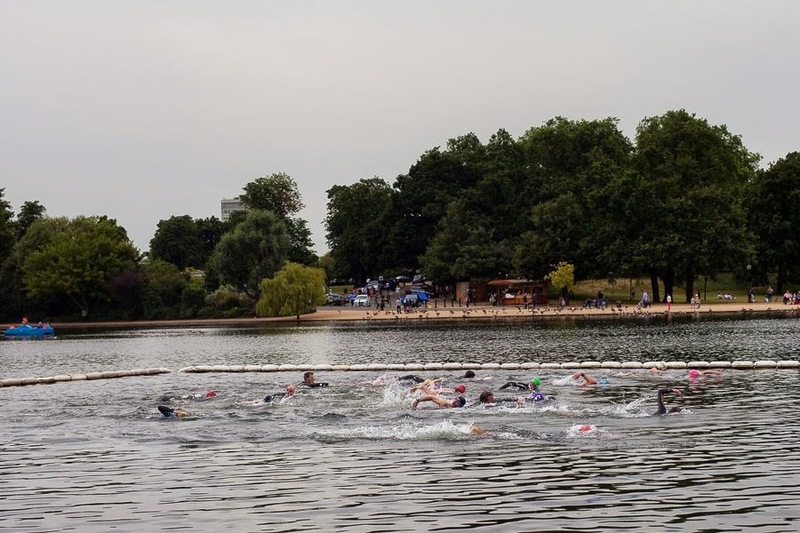 Swimming lengths felt different from my previous triathlon at Blenheim Palace, it was a lot easier to stay on course as the buoy was always directly in front. Climbing out of the water, I stubbed my toe against the concrete step! I ignored the pain and stumbled into the transition area, slid off my wetsuit, off came my swimming cap and goggles, and on went my trainers. I ran out of the transition area in my dripping wet trisuit holding my race number in my hands for the next section of the Aquathlon! The 5k run was 2 laps of an area of Hyde Park starting out along the edge of the Serpentine. I really tried to push myself on the run, focusing on lengthening my stride, relaxing my shoulders and keeping my posture upright. I’ve not run a 5k race in a long time, so I aimed to get a good time over the short distance. There was lots going on in Hyde Park, plenty of runners, cyclists, team sports and bootcamps as well as a music festival on the other side of the park. There were plenty of marshalls along the loop directing the runners, I did worry about getting lost after missing the briefing, but the route was easy to follow. Passing each marshall, I called out my number as my race bib had blown away into the lake. There were lots of swans, geese and pigeons alongside the water, which freaked me out and I had to run off the pavement to avoid them! After crossing the finish line, I clapped in the final few runners and caught up with Nikki who had been in the first wave. We collected our goody bags which contained water, a Belvita biscuit, a whistle (?) and most importantly a medal! Glen emerged from his hiding place in the bush and helped me pack up my kit! Our times were posted online the following day: I completed the 500m swim in 10:54 and the 5k run in 27:45 giving me a total time of 38:39. I’m really pleased with my times- I’ve got my swim splits down by 30 seconds per 100m since April. I think the run time also includes transition, so this would be a new PB for 5k distance if a minute or so is taken into account for that. Silverfit are running another Aquathlon on 6th August and 3rd September, you can find out more information here. Overall, it was a nice friendly little event and the perfect opportunity for my first dip in the Serpentine. I would like to allow myself more time to get to the event in future, so that I can enjoy the start of the race without feeling rushed and stressed.